Today’s card of the day is not your typical “It’s Monday!” card. Thankfully! It is the Three of Vessels, with the keyword of “Joy”. I felt rather joyous myself at the weekend when the Heron did not manage to take any of my fish, thanks to last years preventative measures. But that’s another story and only slightly Tarot related. It’s a Monday today, for those of us in the UK, the schools go back after a week off school. Most of us will be thankful that the little darlings are out of our hair for seven hours or so, some of us won’t be as it also means an early get up. That part, I say boo too. I won’t be liking the 7:04 radio alarm call. But that said, things get back to normal today. 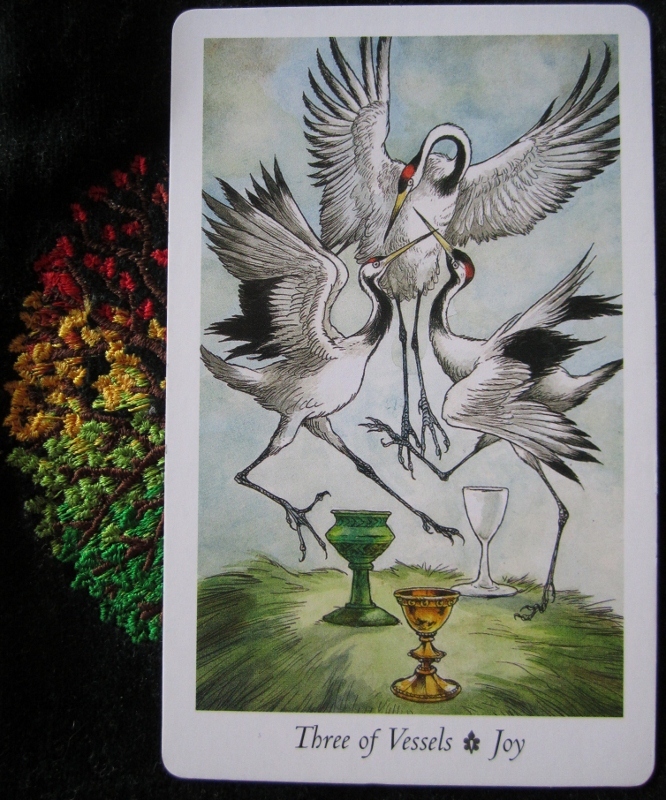 Once again it’s just me, the Tarot and the little one, doing what we do best. I shall enjoy the freedom I have once again and try to work out a strategy on a few new marketing things. So, come and dance with me, come for a coffee, a tea, a drink and we can talk Tarot.